Intel has unveiled 11 new mobile processors for 2010 -- five Core i7s, four Core i5s, and two Core i3s. The chief difference between these processors and their predecessors is the brand new architecture, which couples the 32nm processor and a 45nm integrated graphics controller onto a single chip. To see how the new chips stack up, we tested a pre-production notebook provided by Asus, the K42F. It carries the 2.53 GHz Core i5-540M processor, and sports a 14-inch display with a resolution of 1366-by-768. The unit also contained 4GB of DDR3-1066 RAM, a 500GB hard drive, and Windows 7 Ultimate (64-bit). For comparison, we also looked at the Samsung NP-Q320, which offers similar stats: 13.4-inch screen, a 2.53 GHz Core 2 Duo P8700, 4GB of RAM, a 320GB hard drive, Windows Vista Home Premium (64 bit), and the nVidia GeForce G105M discrete graphics card with 256MB of RAM. While it's important to keep in mind that the Asus K42F is a pre-production model and results are subject to change, it performed amicably, scoring a 105 in the WorldBench 6 test suite. The Samsung scored a 96. The Arrandale line's strengths lie in features borrowed from the 45nm Nehalem architecture -- namely Hyper-threading, and Turbo Boost technology. Hyper threading doubles the number of processor threads per CPU core, offering increased multi-tasking performance without the added power drain of a quad-core processor. 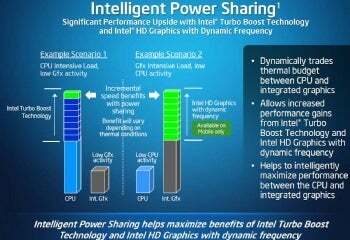 Intel's Turbo Boost technology provides a kind of automated overclocking, pushing the i5-540M from 2.53GHz up to 3.06GHz when applications call for a bit more power. The processor will also dial down performance and power consumption when it isn't required, which will be crucial for media-hungry consumers looking for a portable, energy efficient machine. Energy efficiency and portability are important, but Intel's chief aim is optimizing media playback, specifically of high definition content. With Flash 10.1 offering GPU accelerated streaming, stronger GPU performance is going to be essential for portable machines hoping to tackle web media or Blu-Ray playback. The K42F handled both tasks well, though the battery died around the 2 hour mark of our Planet Earth Blu-ray marathon. Battery performance on standard definition DVDs fared better. By bundling the GPU and CPU onto a single chip, manufacturers using Intel's new line will be able to work with smaller motherboards. This will in turn lead to smaller, thinner machines. While we've seen nettops like the Acer Aspire Revo R3610 tackle HD streaming with aplomb care of nVidia's Ion platform, Atom-based machines have typically failed to deliver when it comes to performance. 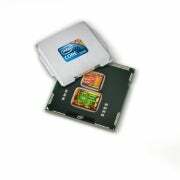 (Netbooks with Intel's upcoming upcoming 'Pineview' Atom processors, such as the N450, will use an optional Broadcom Crystal HD video accelerator chip to handle HD video playback). Meanwhile, Arrandale chips will be able to switch between integrated graphics and discrete graphics on the fly. This will be of special interest to users who don't mind lugging around a full-fledged desktop replacement, but appreciate having an energy efficient option when they're not gaming. Speaking of gaming: performance is still lackluster, but shows dramatic signs of improvement in Intel's integrated graphics. Against the Samsung, the Asus notebook offered an average of 22 frames per second on Unreal Tournament III, and 19 frames per second on Enemy Territory: Quake Wars (1024-by-768-resoultion, high quality). These numbers are nearly identical to the Samsung NP-Q320's GeForce G105M, which scored 22 and 21fps in Unreal and Quake Wars, respectively. If you're running 2D, browser based games, you'll be fine, but avid gamers will still want to look for discrete graphics options. In our suite of tests, battery life on the K42F clocked in at 4 hours -- identical to the NP-Q320. These numbers are likely to change once a production model is available, and as the Arrandale platform evolves: expect later iterations of Turbo Boost and integrated HD Graphics to improve power efficiency. There's a lot to like with the new Core i5-540M, and the Arrandale line. Vastly improved Intel integrated graphics will lead to smaller, lighter notebooks and netbooks, piping out HD content without sacrificing battery or processor performance. There's even a revamped Graphics and Media Control Panel, if you were sick of Intel's limited integrated display offerings. The i5-540M we tested, and the full line of new Core i7, i5, and i3 processors will be officially introduced on January 7th. With CES underway and major vendors just days away from unveiling their latest and greatest, expect exciting things coming for the notebook, nettop, and all-in-one PC categories.